The start of the day's play was delayed due to rain, which also interrupted proceedings before lunch. 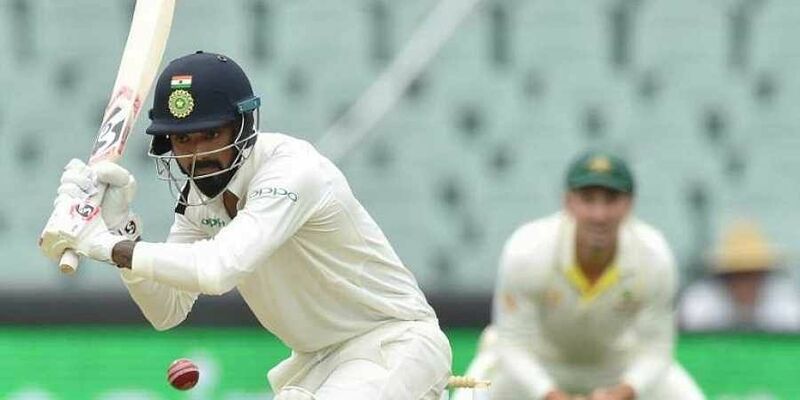 ADELAIDE: India extended their lead to 101 runs even as K L Rahul got out after doing all the hard work in the opening Test against Australia here Saturday. Josh Hazlewood dismissed Rahul (44) before tea on he third day as India reached 86 for two in 29 overs. At the break, Cheteshwar Pujara was unbeaten on 11 runs, while Virat Kohli was on 2. Rain further caused delays post lunch and another 23 minutes were lost before play could finally get underway, with 61 overs remaining for the day. As opposed to the first innings, Rahul and Murali Vijay (18) were more careful and negotiated the Australian pace battery without much discomfort. They left well and looked to cut out any high-risk shots as India were placed at 19 for no loss in 10 overs. Suddenly, Rahul cut loose and smacked Pat Cummins (0-22) all over the park as the score sped to 35 for no loss in the next two overs. His attacking display gave India the impetus as 50 came up in the 15th over. Vijay was the first to go, out driving again, and caught at second slip off Hazelwood. It fizzled out the Indian momentum, even as Rahul continued playing his shots. Pujara survived a scare in the 24th over, using DRS to overturn a caught-behind decision off Nathan Lyon (0-24). But two balls later, Australia's desperation for a wicket paid off as Rahul edged behind off Hazlewood. Kohli walked out to boos from the Australian fans but made sure there was no further loss until tea as India's lead crossed 100. Earlier, rain hampered play as India took a 15-run lead in the first innings after Australia were bowled out for 235 in reply to the visitors' 250. Inclement weather first delayed play by 45 minutes in the morning session, and then there were two more delays in the first session before lunch was taken. During the first 20 minutes of play, starting from overnight 191 for seven, Australia crossed 200 in the 91st over but India managed to sneak in a breakthrough before rain came again. Mitchell Starc (15) was caught behind off Jasprit Bumrah (3-47) as covers came on. Play was held up for 55 minutes thereafter, and the number of overs for the day were reduced to 79. On resumption, the remaining one-hour session was cut short again after 40 minutes but this time India made good used of the overs. Both Bumrah and Ishant Sharma (2-47) were guilty of bowling shorter to the tail-enders, and it didn't change this morning either. Nathan Lyon (24 not out) made good use of this, hitting two fours and a six, as he put on 31 runs for the ninth wicket with Travis Head (72). Head's immaculate knock came to an end when he edged Mohammed Shami (2-58) behind, and the very next ball, the pacer finished things off with Josh Hazlewood out caught similarly for a first-ball duck. Wicket-keeper Rishabh Pant finished with six catches, while Head faced 167 deliveries in all, inclusive of six fours. Australia were happier of the two sides having added 44 runs in just 10.4 overs of play. In their bid to get the lower order out quickly, India were guilty of leaking easy runs. On day one, Cheteshwar Pujara's 16th Test century saved India the blushes. The Indian bowling then attack worked hard to restrict Australia with Head the only one to cross the 50-mark.